When performing a fret leveling on a guitar the frets are filed as a whole, not individually. This insures that the crown of one fret is not lower or higher than the one next to it. Newly filed frets await crowning. Before filing the frets the neck is adjusted flat, the fingerboard masked and the crowns inked with a Sharpie. This ink gives a visual indication to the progress being made and quickly uncovers high frets. 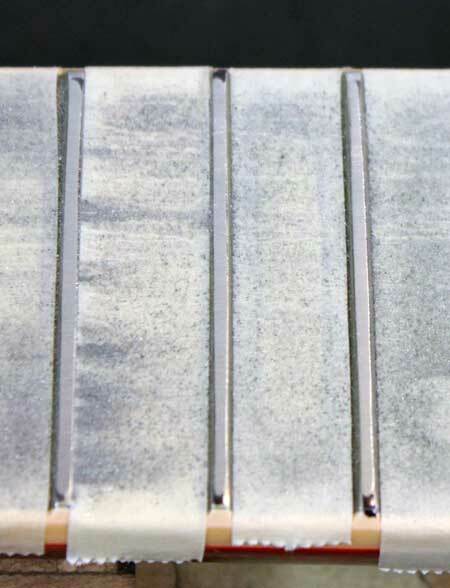 After leveling, the frets crown is not flat and must be re-crowned. The crown of the fret is the center peak which contacts the strings when fretting. The roundness of the fret makes it comfortable to play, the crown insures proper string length and intonation. Special files, known as a Fret Crowning File have rounded, concave surfaces which round over the now flattened fret. Frets are filed until a sliver of the crown's peak remains, untouched. This ensures no height was removed by overzealous crowning. makes contact at dead center. Once the frets have been crowned we are left with level, albeit scratched fret wire. 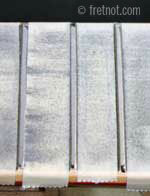 In order to achieve a polished, smooth finish the frets are lightly sanded and polished. Fret height is of course a big factor when considering fret leveling and there is a limit to how short a fret can be and still do it's job, well. Very short frets (say under .025 tall) can create a buzzing problem for some players, especially when the fret width is narrow. The strings need to bend down and over the fret to produce a clear note. A very low fret often dictates the need for more pressure or applying pressure closer to the fret to obtain a clear note. Something that is difficult to adapt to. 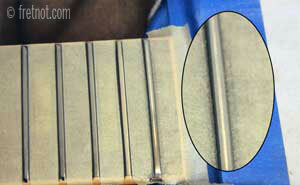 Grooves worn in the tops of frets can sometimes be removed. When considering this option the height of the crown is measured and the depth of the groove subtracted from it's measurement. If the math says the remaining height is too short to play cleanly the frets must be replaced. 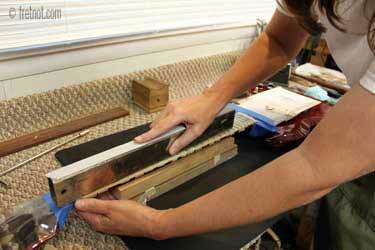 Before frets are ever filed they are checked to ensure they need it!! Unforunately people can and do jump to conclusions about fret height and needlessly file the frets. Usually after hearing a buzz they are unable to identify. While a high or low fret may be the culprit, it is far better to be certain than needlessly remove the playing life of the frets. Let's say you are playing an A note on the 5th fret and a noticeable buzz is heard, but, after moving up to the 6th fret the buzzing disappears. All other notes play cleanly but this one inparticular is always buzzing. The first thing to rule out is a loose fret that has sprung free from the fingerboard and now sits higher than it's peers. Loose frets should be seated and the instrument re-evaluated. On occassion, re-seating a loose fret may not render the frets perfectly level. When that's the case, a level and dress is in order. On acoustic and hollow body guitars you may occasionally see a hump in the fingerboard where it joins the body. Sometimes this hump is caused by a dryness. When a lack of humidity is the culprit the instrument should be given proper humidity to allow it to stabilize and then re-evaluate. When uneveness of the fingerboard can not be remedied with humidity one will either end up leveling the frets, or, in some of the worst cases, remove them to plane the fingerboard before re-fretting.